Alfonso Cuarón's dystopian thriller Children of Men is a stand-out film that remains one of the most striking examples of the genre. It's well-known for its long takes and editing that places your right inside the frame. The brilliant hand-held camera work gives us an up-close look at this environment devastated after people stop having babies. Working alongside the cinematography is the set design, which deserves more credit for building just the right mood. The 2027 world that we see isn't that different from what we experience today. There are subtle improvements in the technology, but those rarely stand out as obvious ploys to make it futuristic. When Theo Faron (Clive Owen) steps into a Fleet Street coffee shop in the opening scene, it feels similar to a business that you might see today. Everything feels more run-down and gritty, but it isn't clear just how far this world has fallen into ruin. It's only after the bomb explodes and we learn more about the situation that we truly understand the horrors of this future. The images of crowds of refugees pleading with the army to let them through are shocking and don't feel that far off from the present day. This connection to our reality brings a greater relevance that would be lost with flashier visual effects. 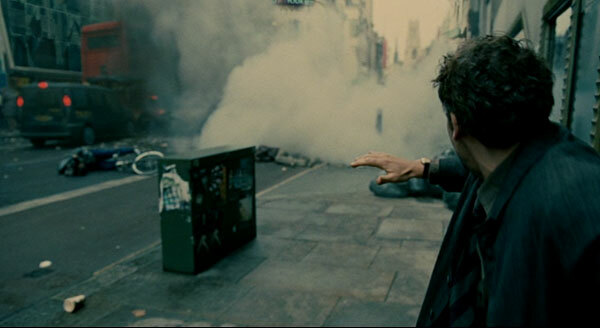 Instead, Cuarón chooses striking locations from the London area that wouldn't seem out of place in 2027. In Theo's first meeting with his ex-wife Julian (Julianne Moore), they stand in a historic maritime building with a hull-shaped roof. Filmed at the Chatham Historic Dock, this moment is a lot grander because of the stunning background. It feels more like the first meeting with a Bond villain than a well-meaning terrorist. This movie is filled with scenes like this one where the set design seamlessly fits into the story. The lack of an Oscar nomination for Art Direction is remarkable, especially since a forgettable picture like The Good Shepherd received a nod. This is one of the most distinctive sci-fi films in the past decade and has lost none of its impact six years later. Because of the reliance on practical locations over CGI, the story should remain timely for a long time. Although society has become an unforgiving place, there are a group of government officials and other wealthy souls who are still living the high life. When Theo goes to visit his cousin Nigel (Danny Huston), it's a stunning counterpoint to the rough world outside. Famous artwork has been brought to this massive structure to house the important government minister. While the masses struggle, he eats a fancy meal in the vast and nearly empty room. The disused Battlesea Power Station serves as the exterior for this location, while the entry hall is part of the Tate Modern. Setting this official building inside an old power station is a direct nod to this museum, which displays modern-art exhibits in the former Bankside Power Station. Just a few shots of this expensive art and luxurious accommodations say plenty about the out-of-touch officials. Nigel may pay lip service to understanding what's happening, but he's living far from the horrors outside. He's shut himself inside this grand building just like London has isolated itself from the desperate refugees on its borders. 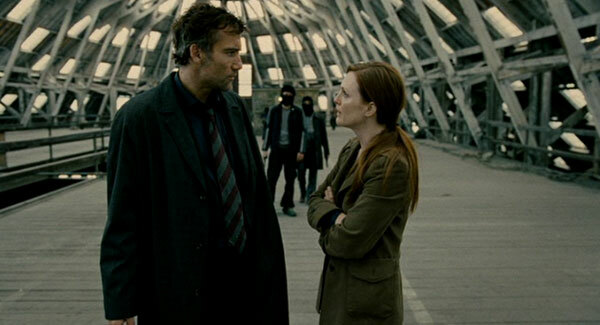 Children of Men's final act sends Theo and the pregnant Kee (Clare-Hope Ashitey) into the Bexhill refugee camp to meet up with the Human Project's vessel. When all hell breaks loose, it becomes a struggle to survive and project her newborn child. The cinematography from Emmanuel Lubezki (The New World) is at its best during this sequence. We're thrown into the action, and the set design sells the feeling that anything can happen. This is pretty much hell, and the blasted out buildings and lack of color enhance that dreary atmosphere. It's a brilliant conclusion to a movie filled with remarkable moments. I haven't even mentioned the country-road ambush, which holds a single take for more than four minutes. The technical precision involved to coordinate the extras, gun shots, and car movement while keeping the camera in the right place is amazing. This precise direction combines perfectly with the set design to deliver one of the signature films from the past decade. What a brilliant post! I love this movie, mainly for the look it has - such a terrifying vision of the future. Thanks Stevee! 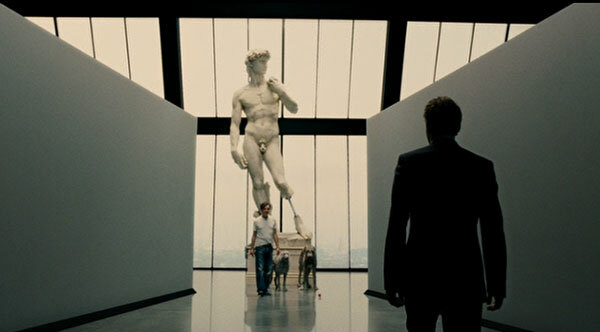 I hadn't seen Children of Men since the theaters, so it was great to revisit it for the LAMBcast. You should check out that podcast if you get the chance since you're a fan of the movie. I wasn't planning to write a post about it, but the set design really struck me this time.